Minister Katherine Zappone announced plans to open 11 new Family Resource Centres yesterday. CHILDREN’S MINISTER KATHERINE Zappone has raised concerns about the impact of gangland violence on young children living in disadvantaged areas. 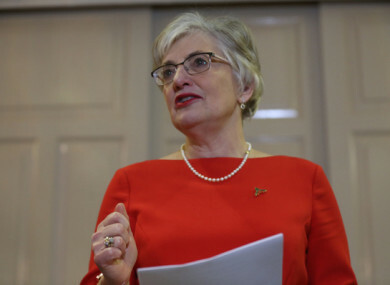 Minister Zappone made the comments at Hill Street Family Resource Centre in Dublin 1, just around the corner from where gardaí foiled a potential gangland hit on Saturday morning. Four men were arrested on suspicion of conspiracy to murder and a range of weapons, including a sub-machine gun, a semi-automatic pistol and a revolver, were seized by gardaí. “I’m tremendously concerned about crime,” the Dublin South-West TD said before highlighting the role the resource centres play in protecting children. “What is the way to invest to prevent that, to protect children? It is particularly in relation to Family Resource Centres,” she said. Not only because of what happens in Family Resource Centres but also because of the network of parents and staff who work together in order to try to plan for better times for their children. The minister attended the centre in Dublin’s north inner city to announce plans to open 11 new FRCs around Ireland. The centres are primarily located in disadvantaged communities and they work to provide early-intervention child and family supports. Tusla is investing a total of €16.37 million into the programme in 2018, an increase of 21% compared last year. “Family Resource Centres are rooted in and part of local communities and as a result they can identify need in families and communities early and offer appropriate interventions and supports,” Jim Gibson of Tusla said. Email “'Tremendous concern': Children's minister warns of impact of gangland violence”. Feedback on “'Tremendous concern': Children's minister warns of impact of gangland violence”.